This is Easy Indigo, and he’s the benchmark to which I’ve compared all other horses. This was taken from his last rodeo weekend in 2006. Currently, at 27 years young, he babysits all weanlings raised at my mom’s ranch, including baby Cinco. I almost cried in my trailer last night. It wouldn’t be the first time; I’ve actually hung an extra towel in there in case the floodgates open. Over the last several years, frustration, depression, and embarrassment have all found an outlet in that tiny tackroom. I’d never show those emotions in public. Instead, I hold it in, tell my horse we’ll do better next time, and carry on until I’m by myself. Last night was different. For the first time in a long time, I felt like there was hope. Just a few years later, I became that person, and coming back from it is one of the hardest things I’ve ever done. My story is not unique or original, and I’m sure many of you can relate. I grew up riding horses on the ranch. I ran barrels, poles, roped, and also did a stint riding English and improving my balance and coordination even more. I was gifted an amazing horse, Indigo, from my mother when I was 19 years old. In two pro rodeos, he’d filled my Women’s Professional Rodeo Association permit. 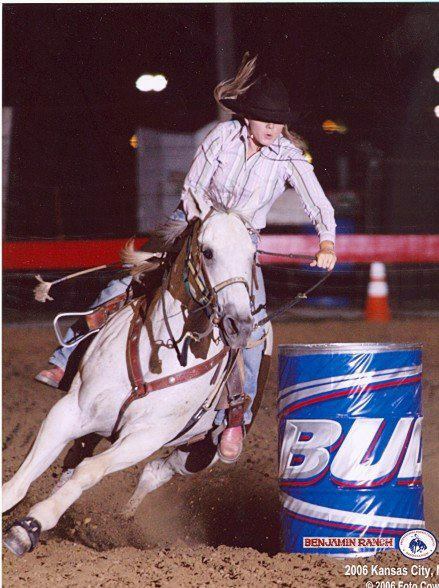 I was finishing up my degree in journalism and broadcasting at Oklahoma State University and rodeoing on the weekends. I had a boyfriend and got engaged, and life was good. Then Indigo got hurt at a rodeo in the summer of 2006. He fractured a bone in his leg, and although we tried all the therapies, he never came back 100 percent. I got married, and work and being a wife took all my time. While I had a few horses that were successful, I never had another Indigo. That’s when the weight began to creep on, and doubt started to cloud my mind. A few years later, I was divorced, overweight, and desperate to have a new start. When I was offered the job as Associate Publisher of Barrel Horse News, I knew God had answered my prayers. An amazing job in a new state was just what I needed, and I’ve never regretted it. Unfortunately, it’s not easy having this job and training horses. I’d never been in a position where I didn’t have a great setup to ride and friends and family to go to jackpots with. I’d never had to contend with a two-hour round-trip commute that cut into my riding time. I was tired, and while more weight piled on, my motivation completely left me. Over the last five years of working and living in Texas, I’ve had horses come and go. Occasionally I’d make it into the 2D, but most of my time was spent in the 3D. That’s where the tears come in. I remember vividly one run at a jackpot in Denton, Texas. My horse turned the barrel, stumbled, and instead of staying in the saddle, I rolled off. I felt utter humiliation. There have been too many times to count that, in terror because of the speed, I’ve gone to the saddle horn too early causing my horse to crater the barrel. One time my horse threw a fit in the alley, and while the old Savannah would have stayed calm and helped him through it, I panicked, jumped off, and walked him out of the arena. Perhaps the most devastating time was hearing someone say, “She’s too fat to be a barrel racer.” I barely made it to the trailer that night. Please don’t get me wrong. There were some success stories. I had a colt I kept through all my life transitions. We finally jumped into the bottom of the 1D a couple times, but I knew he had more to give. I found him a great home, where he’s been a very successful 1D horse, and when I think about that I feel proud. There have been some other project horses I know I’ve helped get over alley and barrel issues, and they have forever homes now, too. I think those horses are God’s way of reminding me to keep going and not give up, because without those high points, I don’t know that I could have. Mine and Cinco’s run from October 23, 2017 in Denton, Texas. After a year of ups and downs, we ran our first clean 1D time. Photo by Jo Haigwood. Cut to last night, and the main pony this blog is about. My mother raised a colt by Alive N Firen out of her old rodeo mare Misty. His name is Firen Cinco, and I think he’s the coolest. Mom has several nice horses and sometimes doesn’t have time for them all. When that happens, she sends one to me to run and season. Cinco’s 4 this year, and I first got him to Texas early this spring. Our first run—at an 80+-horse barrel race in North Texas—we placed sixth in the 3D. We jumped around and made it to the bottom of the 2D a few times, and then disaster hit when he fell at the first barrel on some bad ground. He was physically fine after some visits to the chiropractor, but through a series of events, he stayed in Oklahoma for seven months. Mom decided he still fit me better, so at the beginning of September he came back to me in Texas. A few comments were made about me running him at the Barrel Futurities of America World Championships in December, but I didn’t take it seriously. I mean, who am I to run a horse like him in Oklahoma City? That’s impossible—especially since he’s so behind and I’m still 80 pounds above the weight I used to compete at! We’ve struggled a little bit in the time he’s been back in Texas. As the realization that he gets to run has hit him, the adrenaline—and likely a little residual affect from the springtime fall—has caused us to overrun the first barrel. We’ve progressed, but slowly. He’s so talented, and several times in the last couple months I’ve called my mother questioning if I was doing right by him. She’d give me advice, and tell me to keep going. She’s another reason I’ve kept pushing forward. Three weeks ago we would have been in the 1D but hit the first barrel leaving it. That’s when it hit me that I really might need to run him in December. The pressure is real, now. That 80-pound surplus is now only 60, but I know that’s only part of the battle. Last night, I went to the barrel race in Denton. Although it’s been the site of much of my humiliation, it is an awesome place to run where the caliber of horses is always high—even at a Monday-night jackpot. The fastest Cinco has ever ran there was a 16.7, and as I watched each good horse run, I prayed we would just run a mid-2D time. That would make me happy. We were bottom of the ground, and as I entered the arena I tried my hardest to visualize that perfect pattern. It’s amazing what used to be so natural to me is such a struggle. I asked him to run but still held him back a little bit, and when we turned the first barrel, I was elated. The rest of the run was great, and I could barely see the timer as we ran into the alley. We ran a 16.014, and they won it with a 15.693. We were officially in the 1D! As I walked Cinco back to the trailer, I was reeling. Maybe there’s a chance I can help this talented guy become great. Maybe he’s my next Indigo. Maybe he’s my one! There’s hope. As I’m writing this out, there are also the tears that didn’t fall last night. I wanted to share some tidbits of advice and encouragement. Everything matters. All the decisions you make with your horse will make some kind of difference, no matter how small. Take time to make the best decision you can. When you’re at the barrel race, be kind. I’m not the most outgoing person, and moving away from everyone I know has been tough. Some of the happiest moments in my life at a barrel race have been when someone compliments my horse or my run. Those words mean so much—so make it a goal to brighten someone’s day. Thank you for this uplifting article! I’m there myself but now on a new 4 year old. Praying he is the one to get me back in the game! God Bless you! Building your confidence back up after a fall or incident can be really hard. The hardest thing to eliminate is the tendency to focus on what might go wrong. Your brain can only focus on what thing at a time, try and bring yourself into the present moment by concentrating on what’s around you, on yourself and on your horse- use your senses. Focusing on this will help stop your mind wondering back to the incident that’s causing you worry. Building your confidence back up after a fall or incident can be really hard. The hardest thing to illimate is the tendency to focus on what might go wrong. Your brain can only focus on what thing at a time, try and bring yourselves into the presence moment by concentrating on what’s around you, on yourself and on your horse- use your senses. Focusing on this will help stop your mind wondering back to the incident that’s causing you worry.